I was lucky enough to be invited into Animal Cove’s beta (thanks KingsIsle! ), and I’ve been having fun exploring all that it has to offer. For those who are unaware, Animal Cove is KingsIsle’s newest mobile game that is soft launched in select territories. Having completed the game’s first “area,” I thought now would be a great time to recap what’s happened so far and give you all an idea of what to expect when it launches worldwide. 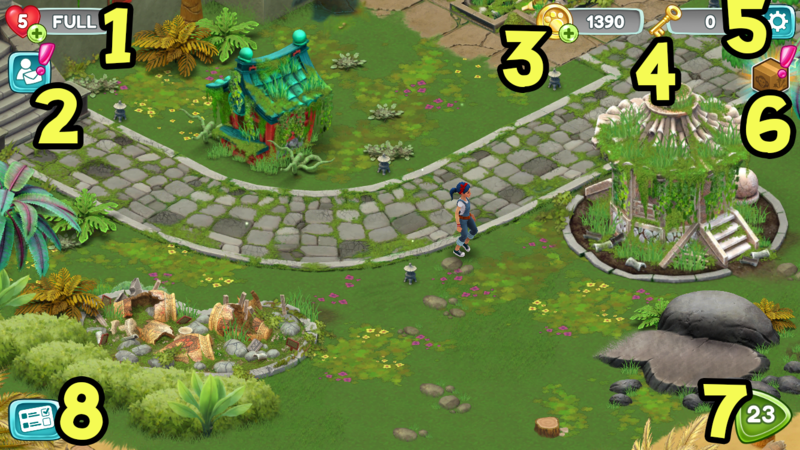 It feels more polished and cinematic than KingsIsle’s previous mobile games. 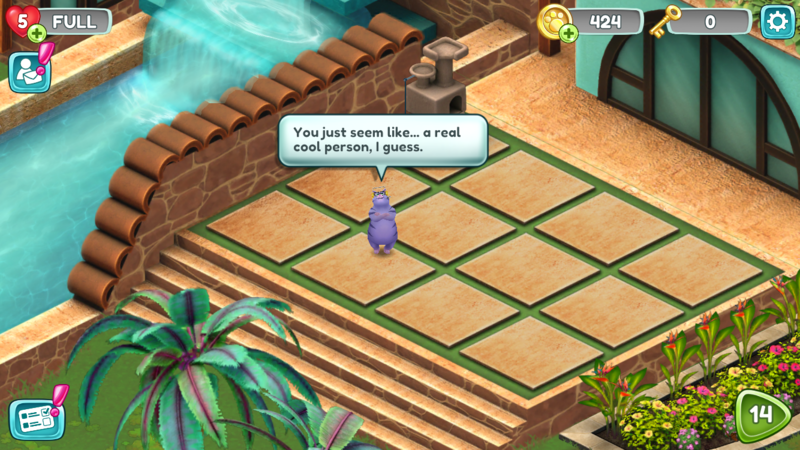 Animal Cove includes a beginning 3D cutscene, completely voiced-over characters, and more character interaction as a whole. 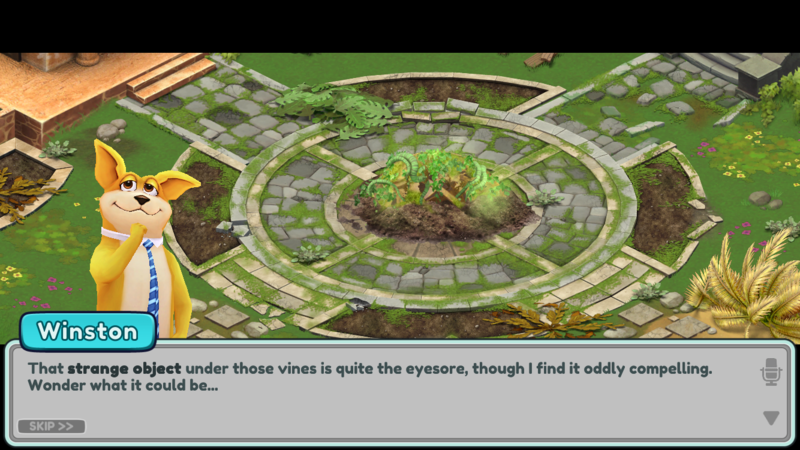 Like in Pirate101, sometimes the characters will actually talk to you without triggering a full dialogue box. It’s a storyline-driven match-3. Animal Cove is all about the story and uncovering the many mysteries of the island you washed up on. In order to unlock more of the story, you have to collect keys by completing match-3 levels. Each level has a different objective ranging from collecting a certain # of puzzle pieces, saving a hedgehog, freeing a starfish, breaking boxes, or opening treasure chests. It’s challenging. According to Katherine_Light (who has completed the game’s existing storyline), Animal Cove has about 100 storyline levels. I’m currently on level 22, and it’s already been a struggle, lol. While a good strategy will help you immensely, most of these levels also require a lot of luck to go your way. So don’t expect a cakewalk match-3 – Animal Cove is HARD and it gets hard EARLY (around level 12 I’d say!). New mechanics/elements are introduced gradually. In my experience, most mobile games introduce the game’s in and outs within a few levels. 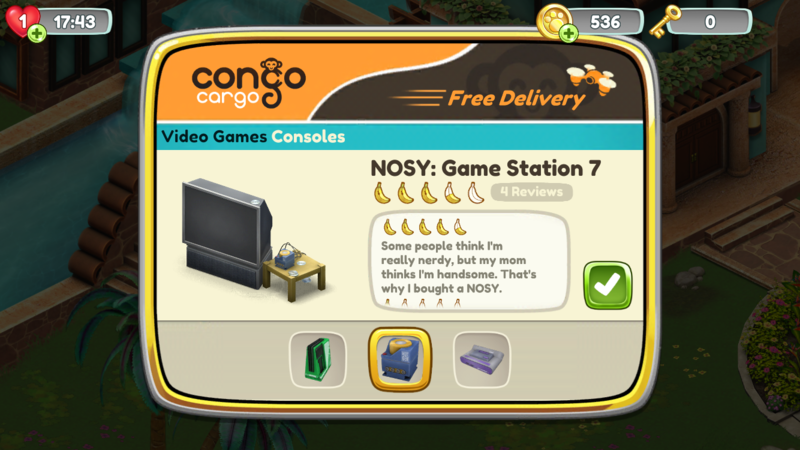 However, Animal Cove constantly presents you with new objectives or game elements well into the storyline. In fact, I just recently gained access to the game’s “Daily Giveaway” at around level 20 or so. There are some really cool unique elements. 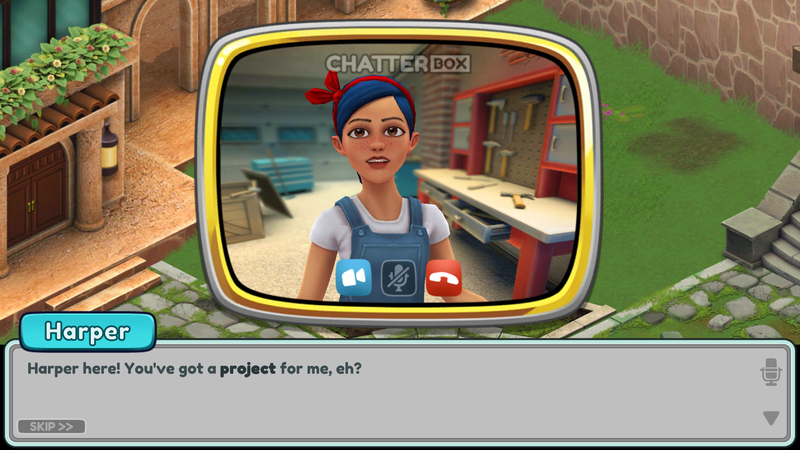 Characters will “ChatterBox” with you (basically the equivalent of Skype), you’ll get to read “product reviews” when you renovate areas, and you’ll have the ability to customize the island to your liking. These are your lives. You start with 5 and will lose one each time you fail to complete a level. If you run out, you’ll have to wait for them to regenerate in order to continue. You can also redeem more lives/hearts from friends who have gifted you. This is your friends list. Here you can view your current friends, send/receive lives, and look for recommended friends. These are your coins. You can use coins to edit already customized areas, continue failed levels by buying more “turns,” buy boosters, and more. This is where your keys are stored. Keys are obtained by completing levels and are used to unlock more of the storyline. This is your settings button. “Nuff said. This is the “Daily Giveaway.” Each day you’ll be able to spin to receive a random item to help you in game. This won’t unlock until level 20 or so. This button shows you your current level and takes you to the puzzle board. This is what I call the “Task” button. Here you can view your current objectives, see how many keys you need to unlock them, complete character-specific missions, learn more about the animals you’ve encountered, and watch cutscenes you’ve already seen. This is your goal. 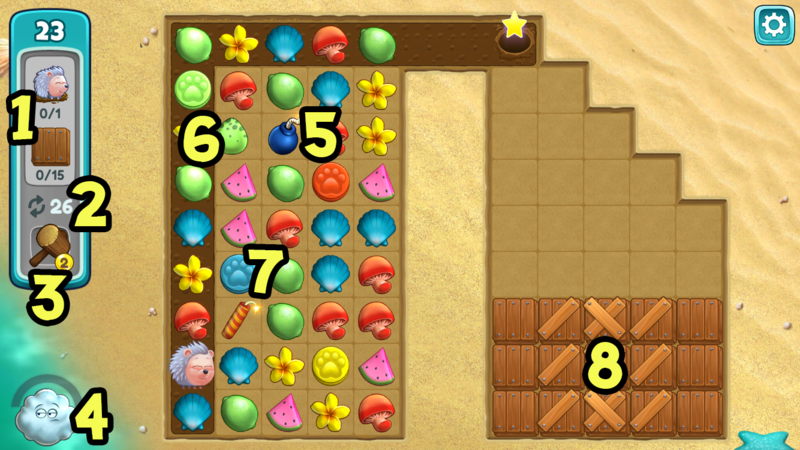 To beat the level, you need to successfully achieve what’s shown here. This is the number of turns you have to beat the level. This is the “Hammer.” The hammer can strike a box on the board to remove a reinforcement or destroy the box completely. This is the “Thundercloud.” In order to use it, you must charge it. 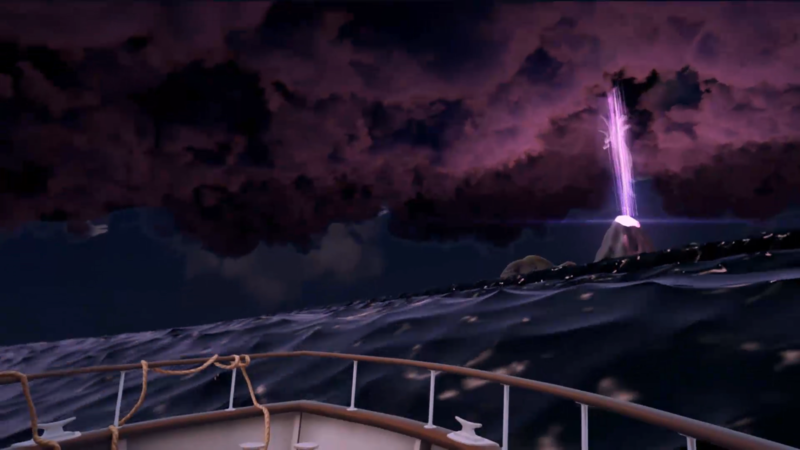 The thundercloud can be charged by setting off bombs. Once you do that, you can use the thundercloud to remove ALL pieces of the same type. A bomb. Matching at least 4 pieces together will create a bomb. The more pieces you match, the bigger the bomb you make. Combining a thundercloud with a bomb will create EVEN MORE bombs! An egg. If you match 4 pieces in a square formation, you’ll create an egg. Match an egg with its corresponding color and it will hatch a helpful chicken! Each chicken will make a move on the board that will help you achieve your goal. A paw piece. These only appear on levels that contain a hedgehog. Whenever a paw piece is included in one of your matches, the hedgehog will move forward one space. A box. Boxes can be destroyed by making matches next to them. Boxes that have panels on them are reinforced and need more than one match to break. (Not shown) Roped pieces. Roped pieces can’t be swiped or moved. You can get rid of roped pieces by making matches next to them. If you want to avoid Animal Cove spoilers – NOW IS THE TIME TO LEAVE (it’s okay, I’ll understand!). 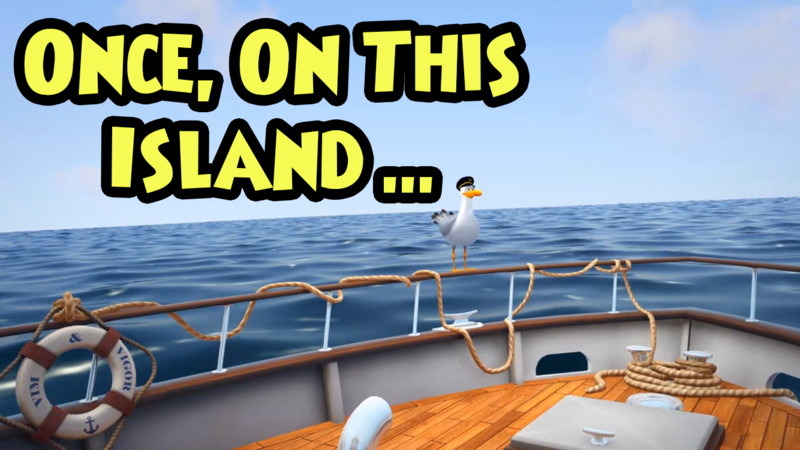 The game starts off by showing you on a boat. It’s a calm day with peaceful waters …. or so you think. In the distance you see a volcano. The volcano then unexpectedly releases a strange bright light into the atmosphere … causing the sky to become engulfed in darkness. Not long after, an aftershock creates a force powerful enough to rock the waves and tips you overboard. As you’re getting pulled under, the last thing you see is your sinking boat disappearing into the depths of the ocean. While looking around, you meet a young girl named Harper. She says that she’ll be the one helping you out with any and all construction needs. Once she puts the finishing touches on your bunk, she leaves so you can further explore the island. After doing a little digging, you realize that strange object from earlier is actually a massive globe. You and Harper are able to pull it out of the ground, but it’s still in bad shape. In the meantime, you and Winston decide to investigate some rustling in the nearby bushes. When you approach, a purple cat pops out. He introduces himself as Dez, but states that he doesn’t know how or why he’s on the island. He does however, offer to be your communications expert. After ordering him some “special equipment” (that looks an awful lot like a video game console), Dez tells you that he will be able to keep in radio-contact whenever you venture further into the island. Remember that massive globe you dug out earlier? Harper fixed it up and in the process – discovered a worn map of the old amusement park. You can’t quite make out the whole thing, but it does give you some valuable information. For instance, the globe you discovered once resided in a completely different part of the park. How did it end up all the way over here? Excited about your recent discovery, you decide to call Elias. Although he’s happy to hear about what you’ve found, Elias has more pressing matters for you to attend to. Apparently he’s found a panda somewhere on the island and tasks you with helping it. The shoreline is no place for a panda though. Using your newly discovered amusement park map, you locate an area of the island called “Mysteries of the East.” That sounds more fit for a panda. Eager to get things rolling, you and Winston decide to travel to “Mysteries of the East” while Dez stays behind to handle communications. To keep up to date with Animal Cove, be sure to follow them on Twitter here and browse the official forums.